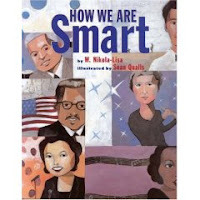 How We Are Smart by W. Nikola Lisa, Illustrated by Sean Qualls. Copy supplied by publisher, Lee and Low Books. It's About: The many ways people are smart: book smart, art smart, nature smart, body smart. Or, as is explained in the back of the book, "multiple intelligences". The Good: I like that it recognizes that there are many ways of being "smart" with no one "smart" better than another; often, people are a blend of several intelligences. I also like that no matter what the intelligence, the person achieved because they worked at it; no one is just smart without studying. Marion Anderson sang; but she worked, too, at developing that talent. Thurgood Marshall became who he was because he attended law school; Matthew Henson made personal sacrifices as an explorer. It's summed up best in the following quote by astronomer Annie Jump Cannon: "My success, if you would call it that, lies in the fact that I have kept at my work all these years. It is not genius or anything like that, merely patience." Reasons I appreciate the multiple intelligences approach to people. First, as I noted above, it still includes having to work to succeed; second, kids are so different, that this provides multiple avenues for achieving success; finally, it is respectful of the diversity of talents and strengths that people have. Individuals are highlighted with an illustration, a quote, a poem, their name, and a short biographical paragraph. At the end of the book, there is additional material on multiple intelligences including activities and resources for teachers and parents and caregivers. I like this because it makes things so much easier for adults working with kids, whether it's a parent or a librarian or a teacher or whatever. This also works well with children up to middle school; the poems are short enough that younger children will enjoy it, but there is enough depth that it's good for older kids, also. Qualls' artwork focuses on the face of the person portrayed, with items in the background showing more about their life. For Matthew Henson, arctic exploration with snow capped peaks and dog sleds; Tito Puente, drums and a couple dancing. Since I'm a former lawyer, I'm including the poem about Thurgood Marshall (background showing the US flag, scales of justice, and the Supreme Court). Please note that I contacted the author and the publisher for permission to use this poem in its entirety for this post; and that permission was kindly granted. Are you smart like Thurgood? Permission granted by LEE & LOW Books Inc. Note: The 2, 3 and 4 lines of each stanza are supposed to be indented and blogger refuses to keep the spaces! Any advice on how to fix this? Edited to add: Kelly, for some reason what you have wasn't working; but I did find & nbsp (but without the space) via Blogger Tips & Tricks and that seems to work. Thank you! Edited to add: Blogger hates me. OK, I did add some html and it did work and now all that html code is gone and it's back to not indenting. Today's Poetry Friday is at Mentor Texts & More (NYC Teacher). Sean Qualls also illustrated The Poet Slave of Cuba. Lee and Low Books page for the book, including a preview. An author interview at The Prairie Wind, Newsletter of the SCBWI-Illinois Chapter. Very good information, including how he picked the people included in How We Are Smart. 2007 Christopher Award, Books for Young Readers. I have to have this book! I talk to my students about multiple intelligences often. At the beginning of the year, I have them each make a pie graph with sections for each of the commonly identified intelligences. They decide how big or small each section is for themself. Every graph is different, but every child is 100% smart! That book looks so fabulous. I'm adding it to the list. I love Sean Qualls' work. We got his permission recently to feature his art work at one of our 7 Kicks lists (we're now featuring a different illustrator every week) -- it's here. Thanks for the review. Can't wait to see this. Only put them right together. And be sure there's a space after them. That will make a several character indent. To indent more, type one character set, space, and type it again, then space and type your text. For a short indent, it's & ensp (all together -- there's no bracket around this command, so I can't show it to you the correct way). This is a great book! Thanks for your fantastic review. Cheers!